The CREST Foundation accepts donations from contributors both inside and outside of the industry. Tax deductible contributions from individuals, family trusts, businesses, and other organizations are always welcome. Currently, all contributions are deposited in the Foundation's general fund. In the future, contributions will be able to be earmarked for specific use. 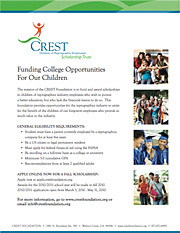 If you are interested in contributing to the CREST Foundation, please contact us at donate@crestfoundation.org. For a current donor list, click here.